Read the Footnotes | "Northern Crossings"
I like to read books with footnotes. Obviously the more footnotes there are the more research has gone into the book. Sometimes reading the footnotes is more interesting than reading the book. There are wonderful things you can find out in footnotes. A book that I try to re-read every couple of years is “The Proper Distinction Between Law and Gospel”, by C.F.W. Walther. You can get it from Concordia Publishing House. Walther’s book is great read for many reasons but it is important to be read and reread because of the nature of human beings to fall back on really bad ideas about the relationship of sinners to the Law and to Grace. There is the tendency to deny the absolute demands of the Law, or to play games with the means of Grace, the Gospel and the Sacraments. One of the foot notes in the book revolves around two fascinating places that I visited in Berlin. When the Prussian government took over in Germany and forced a union between Lutherans and the Reformed, they set up a false church while maintaining the look of a Christian government. They also forced the movement of Lutheran Pastors and individuals to the United States so they could practice their faith. The Lutheran Church Missouri Synod is result of people protesting a “union church”. Once you force upon Lutherans a Reformed view of the Sacraments it is impossible for real Lutherans to participate. This is one of the reasons there are so many so called “Lutheran” churches. Since the Reformed idea of Baptism is that it is a symbol rather than the real thing that delivers life and salvation in the water and the Word you can play all kinds of games with the Sacrament. The Prussians gave preferred government jobs only to people who were baptized in a Union church. 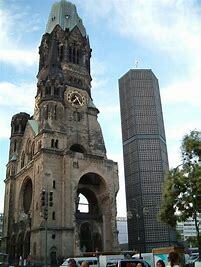 Those interested in such jobs often were baptized in the Wilhelmskircke in Berlin. The church is located near Kaufhaus des Westens, a department store similar to Harrods in London, or Macy’s in New York City. Because the pastors of the Wilhelmskirke baptized any job seeking civil servant as a formality, the church received the nickname Taufhaus de Westens meaning the baptism emporium. I have been to both of those places. The Kaufhaus des Westens or the KDW pronounced Kaw Day Vey is the most incredible store I have ever been in. It is seven stories of the most incredible goods from around the world that you can imagine. When I was there I saw $25000 dollar TV/Audio/ systems. Saville Row suits from London, live eels from the Baltic sea, Russian caviar and Vegamite from Australia. If I remember right one floor is designated for just baked goods and pastries. It was an amazing place. The point is that just as you can by anything at the KDW, you could by a job with the Government by a baptism at the Union Church, a policy that corrupted the church and the government. The Kaufhaus des Westens when I was there was a thriving and prosperous store. I don’t know if it has suffered the same way our retail stores have or not. The Wilhelmskirke has not fared as well. Pretty much destroyed during WWII it remains a shell that is a bit forboding with a kind of haunted quality about it that attracts young people of Goth tendencies. In the evening the place seems like something out a “Dracula” movie. Locals call it “der hohle Zahn”, the hollow tooth. There is a lesson there. Corrupted doctrine corrupts a church. Corrupt Governments will try and coopt the church as much as possible until it realizes that the churches influence is gone usually because it joined up with the Government in the first place. If Everything I Had Was in a Blue Box. Phantom Speeches and Phantom Opinion and the State of the Union. Did you intend to say: “The Constitutional Separation of Church and State… also prohibits the government from allowing people the free exercise of their religion”? This is what is being attempted in practice, but is the very opposite of the intent of the Bill of Rights. You are right, this is a drum worth beating. the “exercise” of religion is to daily practice/do what you confess on Sunday.